On the first Sunday of August, we finally had Autumn christened! 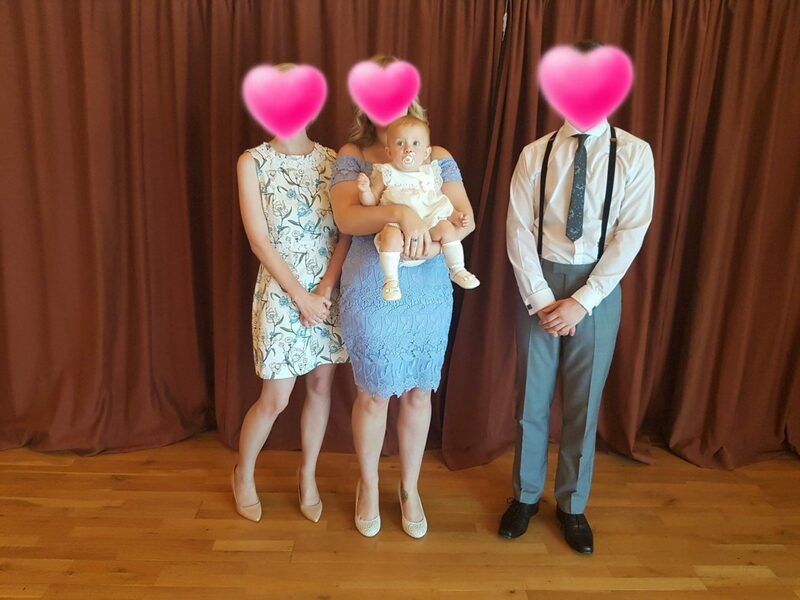 When I was pregnant, I thought I’d have her christening in the first 6 months. However, if you’ve been following our story, you’ll know that things didn’t quite go as we thought they would in the first few weeks of Autumn’s life. 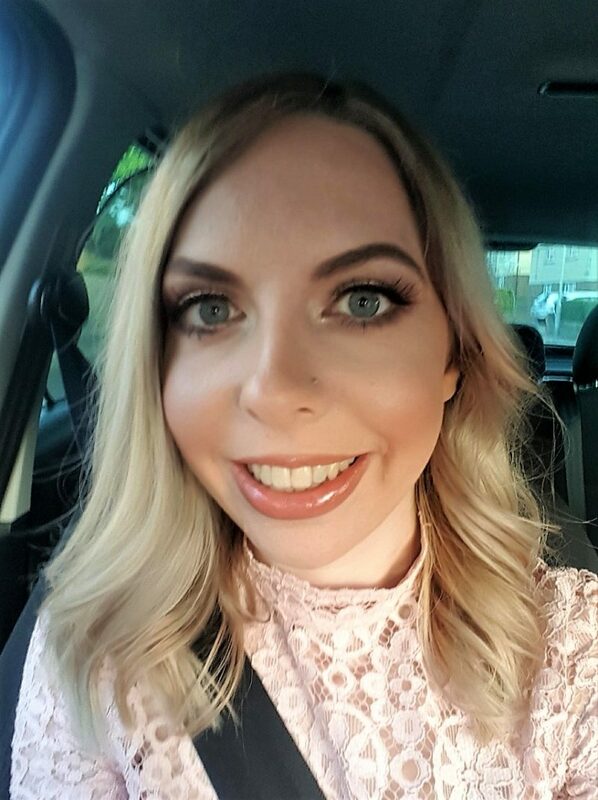 It took a long time for me to recover, so the stress of a social event was not something that was on the cards for quite some time. However, in her 10th month, the time finally came. I had so much fun planning it all, although it was quite stressful! I planned it all in the space of about two weeks. I’m usually far more organised than that, but after a bereavement last month, the christening kind of sneaked up on us. 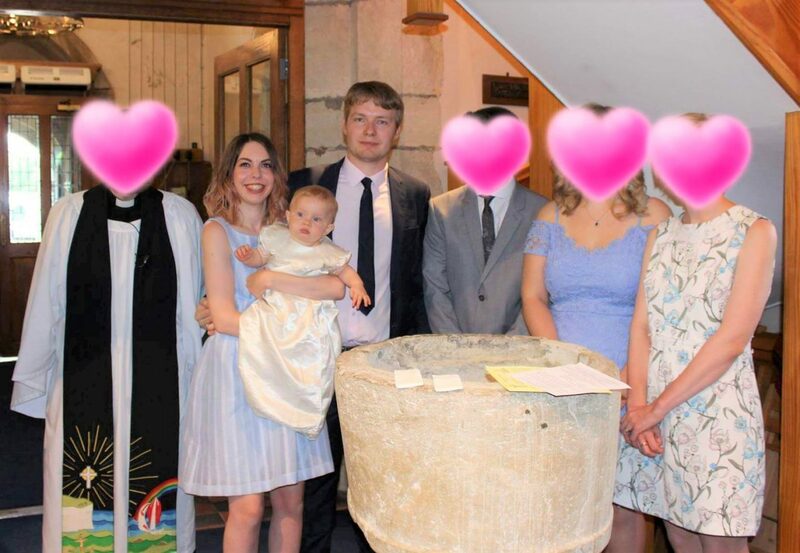 Choosing the Godparents was the first step to planning Autumn’s christening. After a brief discussion, we decided on my brother, Dave‘s sister and one of my oldest friends. Of course, the traditional purpose of them is to help to bring up your child as a Christian. However, in most situations this is no longer the case. 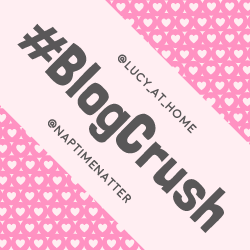 Whether you’re sticking to the traditional meaning or not, I think it’s important to choose people that you feel close to and care about your child. Generally speaking, I think they should be someone that you think will be in your child’s life for decades to come. The next step was getting some invitations made and sent out as quickly as possible. I chose Optimalprint, who I’ve previously used for my wedding thank you cards and newborn thank you cards. 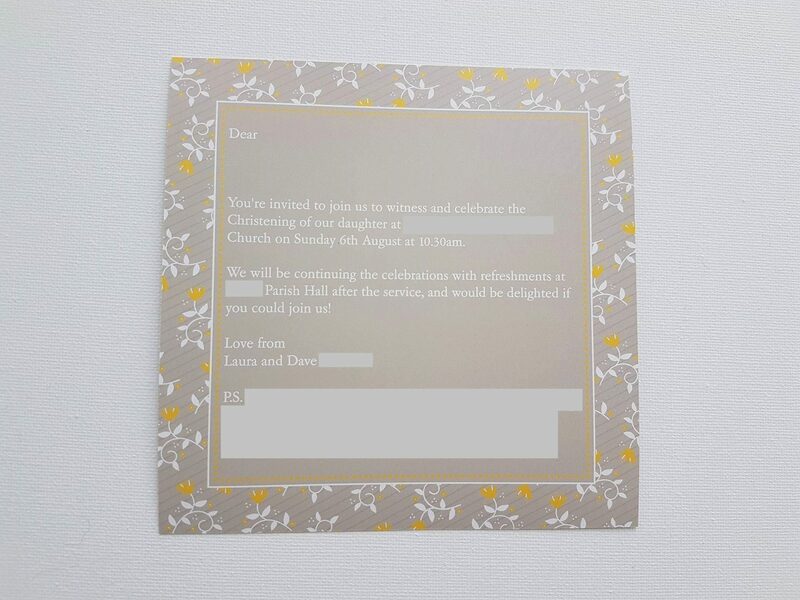 They often have offers on that make their invitations fairly reasonably priced. They’re easy to use, have a lovely range of designs and the cards I’ve ordered from them have always arrived very quickly! They’re lovely quality too. 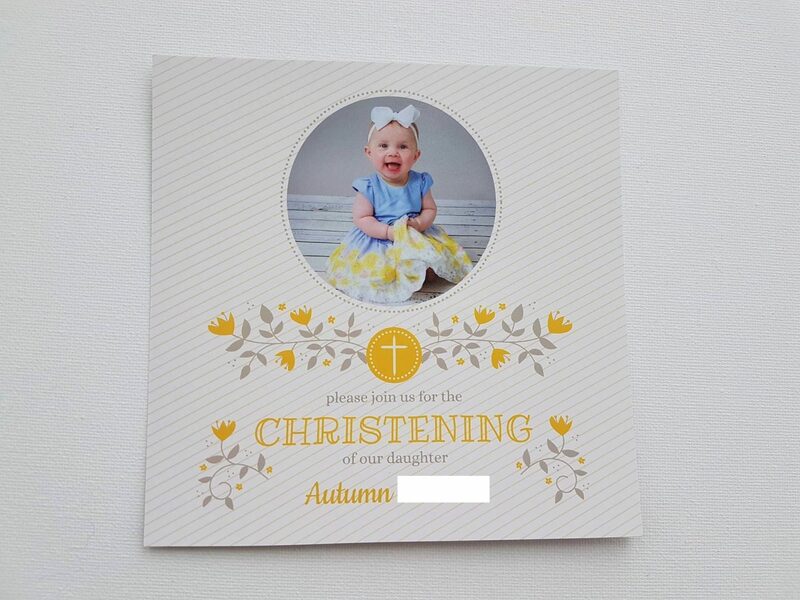 I love how our christening cards turned out. We used one of the photos from our Emma’s Diary session on the front. The church I attend was obviously going to be the choice of venue for Autumn’s christening. I think our vicar was quite excited about it! For the party afterwards, we chose the parish hall. It was very reasonably priced and was a good blank canvas for decorations. We decorated it the night before, as there was a lot to do in the morning too. Surprisingly, it took us hours! In the meantime, Autumn enjoyed crawling around the hall while we were all busy. I didn’t want to go too overboard with decorations, but I wanted it to look pretty. I ordered special bunting, christening plates and matching napkins with pink elephants on from eBay. They also did matching cups, but I decided it wasn’t worth the extra expense with those. Instead I went to Asda and bought their cheapest plastic cups, plastic wine glasses and cutlery. One of my most favourite parts of planning Autumn’s christening party was my visit to Bustles and Breeches in Gravesend. It’s a shop full of party things and beautiful dance wear with lovely owners. 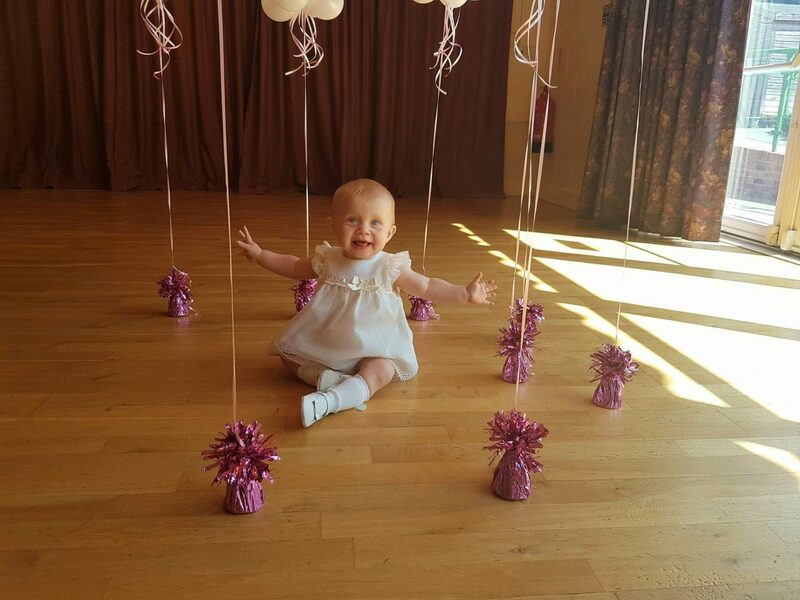 I ordered pink tablecloths as well as my favourite part of the decorations; the balloons! 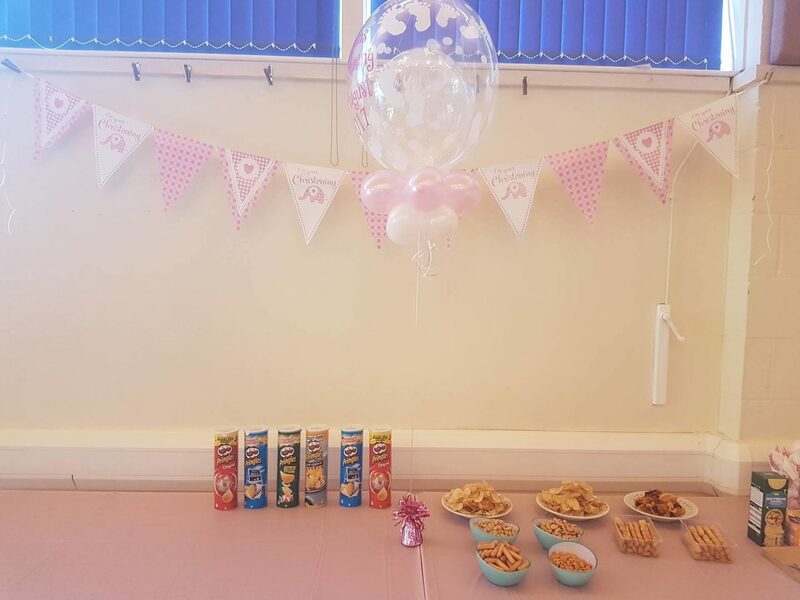 We had two pink heart shaped balloons either side of the cake table, as well as special big balloons for each table. 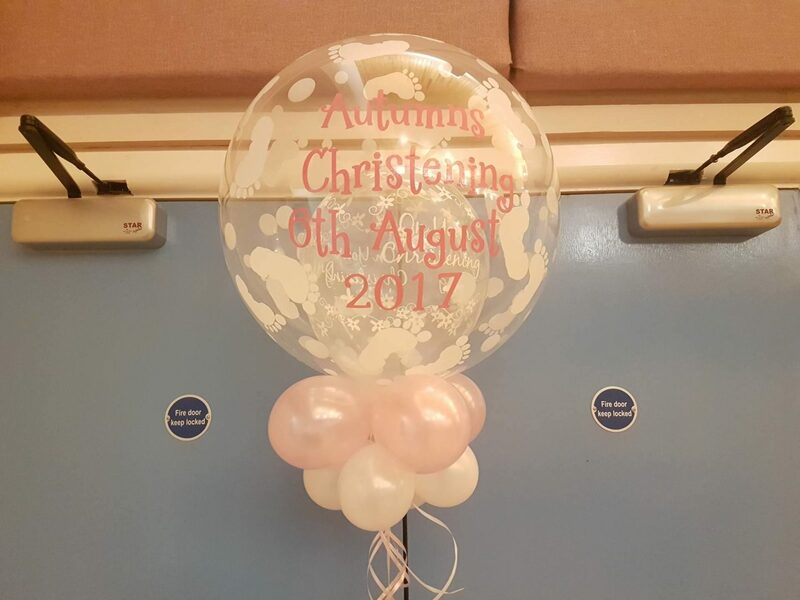 They said ‘Autumn’s Christening’ and the date on the big external balloon which had footprints on it. The internal balloon was a gorgeous christening balloon. They were my biggest expense, but I think they were worth it as they really set everything off! Several relatives kept asking who we were going to have cater for us. I didn’t want to pay for catering, as I know it’s expensive. As such, I decided to go for Marks & Spencer’s party food. I ordered it online and we collected it the day before the christening. Yes, it was still expensive, but it was really tasty and still cheaper than paying for catering. 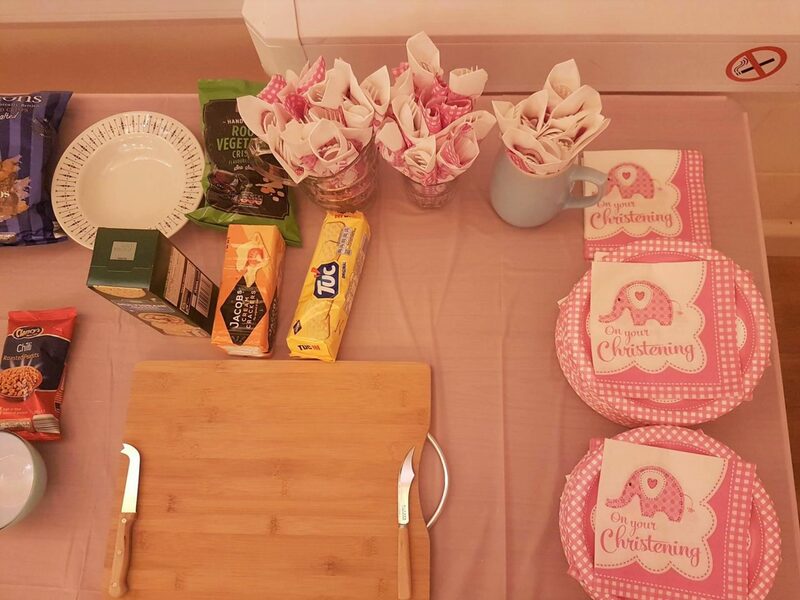 As well as the food from M&S, we also ordered cupcakes from a local cake shop and bought some things including nuts and Pringles ourselves from supermarkets. All the wine we bought were award-winners from Aldi and Lidl. 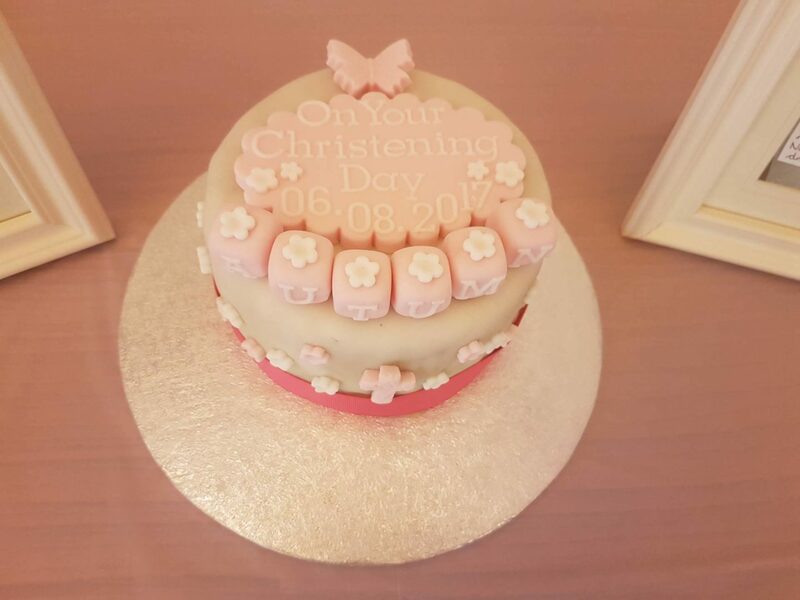 It’s traditional to keep the top tier of your wedding cake for your first child’s christening. As such, after we got married, we wrapped up the top tier in foil and put it in a tin. After 2 years and 8 months of the alcohol inside it maturing, it is rather strong! 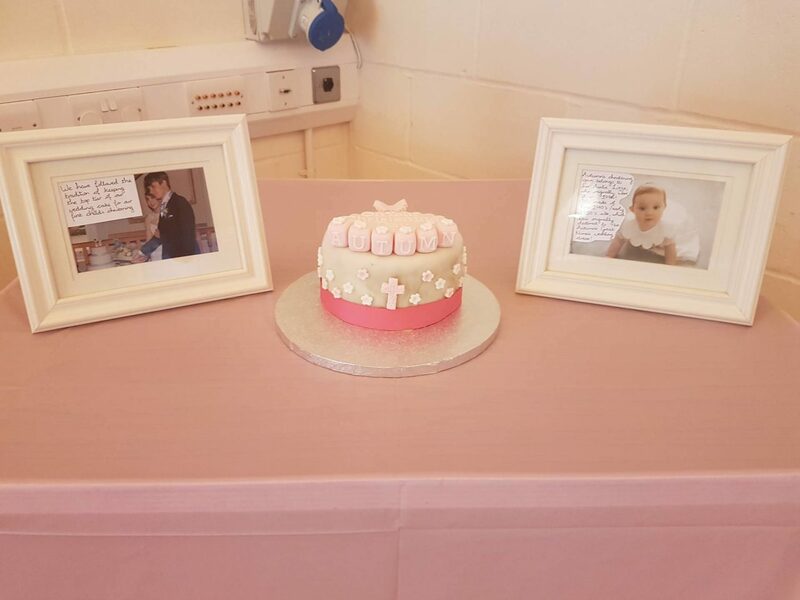 I put photos either side of the cake explaining the history behind the cake and Autumn’s christening gown (which I’ll go on to explain in a moment). I ordered the decorations from a seller on eBay. Autumn’s christening gown belongs to her Auntie (now also her Godmother!) It’s made of vintage silk from the late 1940’s or early 1950’s. It was given to her grandmother (Autumn’s great-grandmother) when she got engaged. However, it wasn’t enough material for a wedding dress, so it was made into a christening gown in the early 1990’s for Autumn’s Auntie. Trying to get the creases out and cleaning it was a nightmare! I was originally going to take it to the dry cleaners, but I read that you shouldn’t do that with vintage silk. Instead, I gently hand-washed it in lukewarm water with a little Fairy powder and white vinegar. To get most of the creases out, I steamed it in the bathroom and gently ironed it. It’s such lovely soft and shiny material and of course has a lot of meaning to our family. I was so scared of Autumn staining her Auntie’s christening gown. I also wanted something a little more practical for her to crawl in, so my mum and nan put money towards me buying a beautiful Spanish outfit for her from a local boutique. Everyone seemed to have a good time, which, of course, was my main aim! We were joined by family and friends, most of whom we’ve known for years. They all helped to make it such a special day for us all. Autumn was clapping and waving at everyone in the church when we were at the front, which was adorable. She had a nap through most of the party afterwards, but enjoyed some party food. 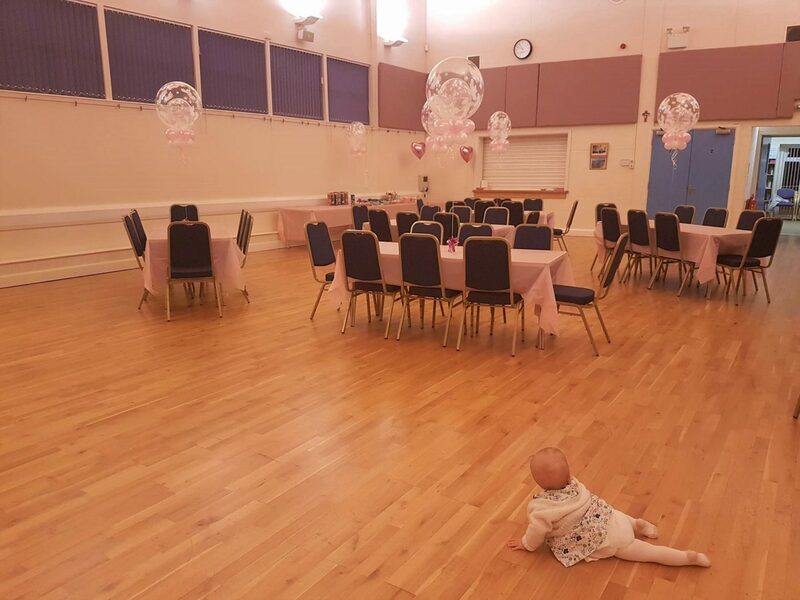 I was glad my mum offered for my family to help with setting up and tidying up the hall, as it was more work than I’d anticipated. It took ages! However, apart from that it all went very smoothly. I love planning events – and it seems to be something I’m pretty good at. 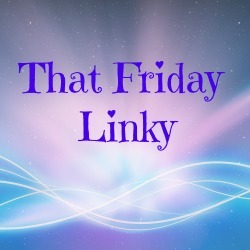 Laura @ Dot Makes 4 recently posted…Ticket To Ride- First Journey: All aboard!